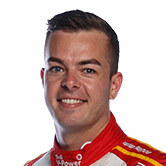 Scott McLaughlin held out a late charge from Supercars title rivals Shane van Gisbergen and David Reynolds to win the opening leg of the CrownBet Darwin Triple Crown. The trio were covered by 1.2 seconds at the line, championship leader McLaughlin having pitted early and van Gisbergen and Reynolds later in the 42-lap contest. Polesitter Reynolds led early, despite a lock-up into Turn 1 on the second lap, ahead of McLaughlin, Rick Kelly, Anton De Pasquale, Jamie Whincup and van Gisbergen. Behind Reynolds, Kelly and Whincup were among the first to pit for tyres, on lap five. Whincup drew alongside Kelly in pitlane but ultimately propped at the merge cone to drop in behind, and McLaughlin did enough to stay ahead of both of them after pitting one lap later. 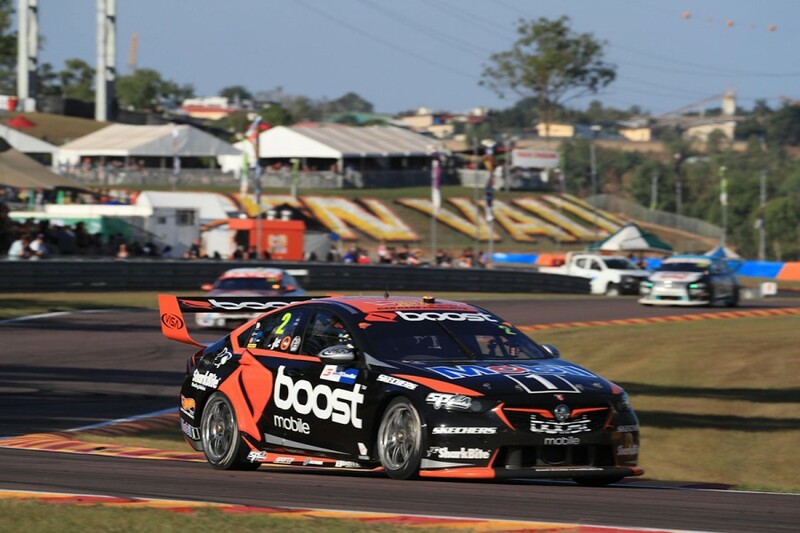 Reynolds continued at the front with his advantage over the pack gradually reduced by van Gisbergen, from more than three seconds to less than one by lap 15. Further down the order, effective leader McLaughlin edged away from Kelly, Whincup and Craig Lowndes, with De Pasquale next on the road after a slow stop. Van Gisbergen pitted from right behind Reynolds on lap 19, and emerged behind the other Erebus Commodore of De Pasquale but was past within half-a-lap. Reynolds finally stopped two laps later, on lap 21, and came out at the back of what became a five-car flashpoint as Kelly and Whincup fought. A defending Kelly and Whincup were delayed at Turn 5, the latter dropping to the back of the pack, as van Gisbergen and Reynolds used their fresher tyres to clear them and Lowndes. By the time he was clear, van Gisbergen was 5.5 seconds behind McLaughlin with 20 laps remaining and that margin was halved within five laps. 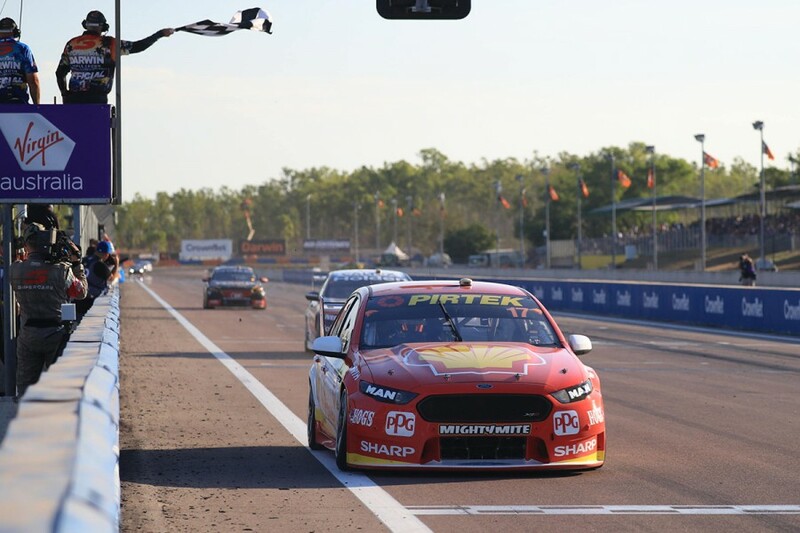 The charge of the late-stoppers continued, and McLaughlin led van Gisbergen by seven tenths and Reynolds by just over two seconds with 10 laps to go. That set up a battle for the win between the pair, with Reynolds lurking just behind as their lap times converged. 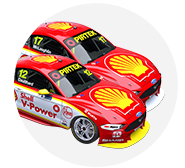 McLaughlin ultimately had enough to take his sixth win of the 2018 season, and the 22nd of his career, by 0.4245s from van Gisbergen. With the victory, Shell V-Power Racing’s McLaughlin extends his championship lead over van Gisbergen to 143 points. “I’m glad I don’t wear one of those heart rate sensors for the TV, I would have blew the bloody thing off the Richter scale,” McLaughlin said. “We took a punt there, obviously the other strategy was probably a bit faster, but the team put a lot of belief in me to bring it home and thankfully I did. “We all know Shane is a hard charger, I respect him like no other, and it’s certainly great to hold him off. Lamenting the time he lost early, from fifth on the grid, van Gisbergen still took his seventh podium of the campaign. “Scotty was driving awesome, good lines at the end, I couldn’t get through,” the Red Bull Holden Racing Team driver said. Reynolds crossed the line 1.2641s behind McLaughlin and van Gisbergen to move back into third in the standings after a tough weekend at Winton. “I’m slightly disappointed. Any time you start on pole you’re kind of expected to win, but it’s a Saturday podium for us which is a bit rare,” he said. “It was a good race, you couldn’t throw a blanket over us at the end there, it was just who had the balls to pit first. Behind the podium finishers, Scott Pye and Garth Tander jumped the early-stopping group that had been trailing McLaughlin during the middle phase of the race. Pye pitted on the same lap as Reynolds, while Tander - who started 13th - was one of the last to pit, doing so with 15 laps remaining. They finished fourth and fifth, having made light work of Kelly, Lowndes and Whincup, who filled the next three places. Nick Percat took ninth, holding out Michael Caruso, who was another late-stopper but one who lost time before pitting through an off at Turn 1 in his Nissan. De Pasquale crossed the line in 11th as the best rookie, ahead of lead Tickford Racing driver Cameron Waters, Will Davison, Tim Slade and Fabian Coulthard. Waters’ race included contact with team-mate Mark Winterbottom at Turn 1 on lap two, when he was tagged into a half-spin by James Golding. Winterbottom was rotated and fell to the back of the pack and ultimately finished 20th, with Golding 25th having been handed a 15-second penalty for the incident.